OH! another wall from Incoent Grey! ^^ lol. Yeah, yeah i know! Bad me.! XD lol. Anyways, this was like... Should i wall it... or should i not wall the scan... And in the end i desited to WALL IT! ^^ lol. As you can see the scan was very cute out, and i had to basicly make up the rest of the bg. I used some water brushes for the waves. made some of my own water waves, and stuff. Added many more of those Gras blades. Cleaned out the scan, added TONS of filters, and effects to make the scan shine (My favortie XD lol) Then, out of her wings i made those Buterflies! yes, you think they look kind of familiour? Yeah, i made them from the two wings on top. Made that... Added the sky, some dark, and light clouds. Added some sparkles to make the water seem like its a pretty lake, and not a swamp XD lol. Anyways, thats it. It doesnt seem like much,i know, but there was A LOT OF WORK! i think this one has more work than the Ebullience one does.... Anyways, it wasnt that hard either ^^' lol. Thats strange i know... I would of had thought that water would be harder to do... But no not really. Anyways, PLEASE COMMENT+FAV! Really happy when those come! :) Thanks for any critics as well. I tried my BEST, so please be very spesific at what you are sain if its critics... Cos i really tried to get everything perfect! :P Really, i mean it! :D l o l.
My only problem is that the water seem to be merging with the clouds.. I know you made it misty.... but it seem to look that way..
That is a awesome wallpaper! I love the colors that you used and the whole atmosphere of it is really pretty! It would be a touch better if you could have alternated the wings on the small butterflys, or even change their color tones a little bit. 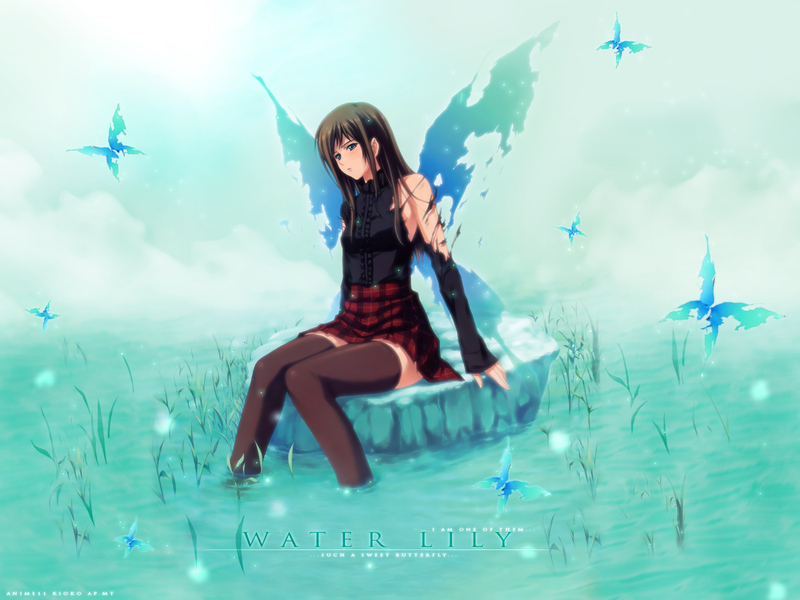 Also the title would be more fitting if she was actually sitting on a water lily. lol Other than that this was is the awesomeness! I also really like the small sparkles you added too! It totally deserves a fav! excellent by far, I really wanted to know how you replicated those butterflys all over so perfectly tho, the extraction for me would have caused some problems if anything. Wonderful capture of watering effects and what I like best is the surrounding. Peaceful by any means. Excellent work deserves a fav. omh, this is so nice..! the fairy efects and all wonderful..! thanks for sharing..! OH this is so pretty! I am really glad you decided to wall this scan because it is really pretty and well I am glad you decided to make it like the scan. Everything looks great and I like how you did the text! Great Job! whenever i see innocent grey CG, it gives me some different feeling inside me..
Wow this is so beautiful! I love the colors, and the visual is great! Good Job! So kawaii! I love the cute colors and the theme is nice! keep it up. wow that's beatiful! You made the bg very nicely! I love it! She looks peaceful if you ask me. Innocent Grey, your wallpaper is awesome and one of the best I've seen. I love how you did the water, especially around the girl's legs. The butterfly wings are well done!